Cottam (AKA Paul Cottam) first came to my attention in 2011 with the incredible slow motion acid burner Sunrise Sunset. It is a stunning record that builds up cinematic tension alongside a brooding but beautiful 303 bassline. This was Cottam's seventh release after first starting out in 2009 with three mysterious 12 inches on his own Cottam imprint. The records were all untitled with just a simple coloured middle adding to the mystique as to who was producing these techno and house goodies. They went on to appear in many of the top charts for that year and sold out due to high demand by the house and techno community. With over two dozen vinyl releases under his belt and little known about the Northern DJ and producer we thought it was high time we found out a little more. Often when an artist appears with their very own label out of nowhere it can be a case of sheer frustration or pure vanity. His reason for starting the label fell into neither camp, it was through chance and honest encouragement by one of his peers. Cottam's early releases were of exceptional quality hence the attention he gained from the start, despite the lack of information attached to initial output. Cottam started DJing at the age of 14 and his switch to production and starting a label was not a decision he set out to make. "There was no thinking behind it, it was just an opportunity I was fortunate to have been given. I had a rack of music that my pal told me to send to a few people and I didn't really expect anything. Rubadub offered to help me with pressing and distribution for my own label and everything that goes with it. I just think I was lucky and in the right place at the right time. I happened to know the right people who had faith in me. It was a fluke plain and simple." That fluke and faith obviously paid off as Cottam was soon signed to Story Records and the experimental house and techno label owned by Will Saul and Fin Greenall from Aus Music. Further releases followed for Use of Weapons and Flight Recorder with the latter release Forgotten Files including another 'untitled track' that goes back to the slow motion genius of Sunrise Sunset and is really worth tracking down. Almost a decade onwards we asked what Cottam had learned on his journey. "I would say yes I have learned stuff, but I still don't really know what I'm doing. I just fiddle and faff till it gets my head nodding." His releases have moved across the various spectrums of house music into techno with the most sublime of deep house to unforgiving hard edged techno. "My first releases were mostly edit type stuff, this was when I didn't use hardware anymore. I'd had loads of ideas in the past so when I started to try make stuff again using just a computer. I thought it was a good place to start and to try and find my way using a computer to make music. I've always kept flipping back to doing edits but it's mainly to just make stuff mixable. I am one of those DJ's who is crap at beat mixing but loves loads of stuff that isn't mixable in that way, so I cheat." Cottam's honesty not to overcomplicate a formula he has tried and tested stems back to a simple desire for music and DJing. "It was a pal who got me into electronic music by the name of Paul Watson, he inspired me and still does." As for the DJing, this is fundamental to Cottam's musical passion. "DJing is my thing and being stuck at home all the time it also helps keeps me sane. I love nothing more than turning my decks on in the morning and faffing for as long as my feet will let me, or until school run time." When Cottam does get out to DJ you're very likely to hear a set (in his words) made up of: "slowish, fastish, techy, soulful, groovy, electronic tinged, Urdu bebop tree slapping with maybe a bit of acid thrown in. It really does depend on the night". Cottam's influences are far and wide and he humbly holds many of them up in the highest esteem despite his own artistic credibility. "I love loads of producers and acts but I could only dream of having the skills to do what they do. They more inspire me DJ wise with their music and I'm very much influenced by Linkwood, DJ Nature, Magic Mountain High, Kyle Hall, Cosmic Handshake, ERP, Kai Alce, Velvet Seasons, Quiet Village, MF Doom, Dj Sotofett.... the list could go on and on and on and on." The self-titled label has so far put out seven select releases over the last eight years with a notable break between 2010, returning in 2016 with Cottam 5. "I have no 'plans' for the future. I've had a kind of an extended break from doing music properly and I might start fiddling again. I would love to start doing the odd gig here and there, but it's all obviously depending on my health. Lets see what happens." Hopefully it is just a matter of time before we see Cottam back on the circuit again as the passion is quite clearly not lost despite his health. As for going forward Cottam wants to release a long player at some point, but is pretty easy about whether that actually happens: "I would like to at some point but what will be will be and all that. Need to get back fiddling first. At present I have had to give up gigging but would like to do the odd gig here and there if anyone will have me. 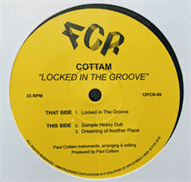 It would help to keep me sane (ish)"
Cottam's latest 12 inch release 'Locked in the Groove' is out now on FCR.